Yep it's bound and on the bed. I feel like I have dragged finishing this quilt out hugely! I just kept getting side tracked. I am glad it's done though, I do love it along with the chair etc. I am mulling around making throw pillows to add to the decor. I have a bit of extra fabric (7 fat quarters). The room needs pictures, mirrors, headboard etc. This is the guest room so...I have some time to build up the decor. p.s. Pot o'gold giveaway is still going. Leave a comment on THIS post. 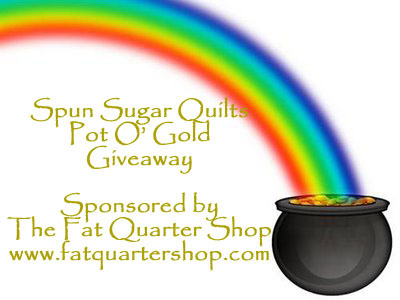 And don't forget the 20% off your purchase at the Fat Quarter Shop with GOLDGIVEAWAY code until 3/17/11. Very nice! Looks great in your guest room. What a pretty guest room quilt!!! So pretty! Usually I don't like quilts on beds, but this one looks very special with the chair! What a gorgeous finish! It looks terrific on your bed! love the quilt, and I am waiting for payday tomorrow so I can use the 20% off code! Sweet quilt....have fun decorating your guest room! I like the light colors in the quilt, looks nice in the room. Love it! You cannot go wrong with authentic! Great job, the Steamy Windows pattern is just perfect for this line of fabric.